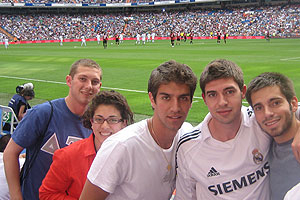 Colin Zizzi attends a group trip to a charity match between Real Madrid vs AC Milan at the Santiago Bernabeu Stadium in Madrid, Spain. Sometimes American University takes you places that you would never expect. Like the front of a classroom to help lead a popular AU Abroad course. Or the fields of a professional club soccer team in Spain. Colin Zizzi, BSBA '10, began that journey in the summer of 2009 with AU Abroad’s summer internship program in Madrid. The internship director in Madrid suggested that Zizzi develop a proposal for a new course; it was a suggestion that led to a unique opportunity he had never expected. Intrigued by the idea, Zizzi and Nidhal Charfi, a fellow Kogod student and AU soccer teammate, outlined the class, and it was presented to and approved by AU Abroad in Fall 2009. The course, IBUS-496 "Spain's Soccer Obsession: Managing and Marketing Soccer Clubs in Spain," was introduced in May 2010 and has become the most popular course in the Iberian Experience program. Zizzi and Charfi headed back to Spain after their May 2010 graduation to oversee the program’s inaugural six weeks. It was a success. The course provides an interactive approach to studying the growing field of soccer as a global business. Students study league formation, team and player promotion, sponsorships and events, soccer tourism, soccer goods and brands, and the media. Now the course — and Zizzi — are back in action for the second time. "AU Abroad decided to offer the course again this spring as a course option for the Madrid Iberian Experience program," said Zizzi, now a graduate assistant for the course. "There are currently 20 students enrolled in the soccer course, which has made it the most popular course among students in the program." The class visits clubs and businesses; past groups have attended a charity match between Real Madrid Legends and AC Milan Legends and watched the Spanish National Team play before their departure to the 2010 World Cup. A bonus: soccer-playing students have the opportunity to play on a team while in Madrid. Zizzi himself played soccer with the first team of a Third Divison Spanish club team, Vallecas CF. "Finally, after consistently training well, I had the opportunity to make my debut for the club’s first division team that plays in the Tercera (Third) Division of Spanish soccer," Zizzi said. "I was very proud to step on the field for my first game, and I ended up playing very well. I received congratulations from many different people at my club." "It was an amazing feeling and something I will never forget."